Teamsters • Transit agency delays response to records requests that could show how much is spent. Leah Hogsten | Tribune file photo Nearly four dozen TRAX supervisors for the Utah Transit Authority will vote Monday and Tuesday on joining the Teamsters union. Teamsters Local 222 claims UTA may be spending public dollars to thwart the organizing effort. 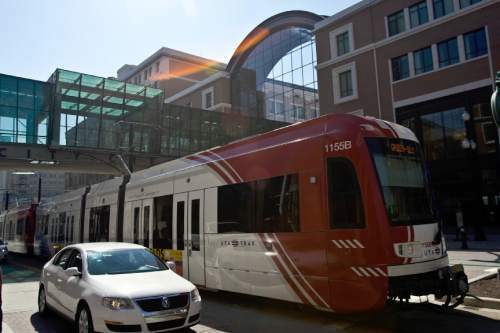 Chris Detrick | Tribune file photo Nearly four dozen TRAX supervisors for the Utah Transit Authority will participate in an organizing election Monday and Tuesday to decide whether they will join the Teamsters union. Organizers suspect UTA is spending public dollars on efforts to thwart the union effort. 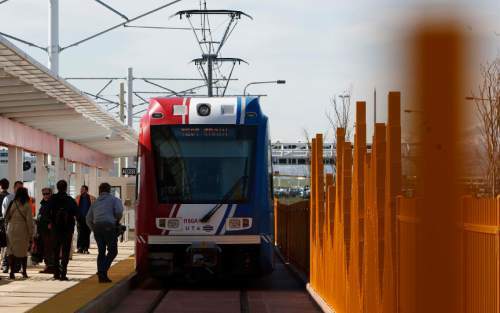 A labor union is complaining that the Utah Transit Authority is likely spending a lot of taxpayer money to try to persuade 44 TRAX supervisors to vote against organizing in an election scheduled for Monday and Tuesday. UTA declined to say whether it is spending any money on the effort or, if so, how much. The agency has delayed its responses to separate open-records requests seeking such information both by Teamsters Local 222 and The Salt Lake Tribune. "They are spending a lot of money," asserts Britt Miller, business agent for the Teamsters local. "Our concern is tax dollars are being used to deny these workers their right to organize." He says that has included a couple years of legal battles over whether the supervisors qualified for potential union representation, which finally led to an election being scheduled. Train operators whom the supervisors oversee currently are represented by the Amalgamated Transit Union. But Miller says he is even more concerned about UTA hiring potentially expensive consultants to try to persuade supervisors to vote against unionization. "The standard organizing response from a company is to bring in what they would politely call consultants and what we refer to as &apos;union busters,&apos;" he says. Miller adds that UTA hired at least two such "union busters," Positive Management Leadership (and its employee Stephen Mordrop) and Labor Relations Institute (and its employee Rebecca Marie Smith). Miller said supervisors reported that UTA held meetings over five weeks trying to persuade them to vote against the union. He said the employees were required to attend initial meetings, but were not required to attend after the second week. He said consultants participated in some of those meetings. The online biography for one of the consultants, Wardrop, says he has more than 20 years experience in helping companies to remain union free, including "developing union avoidance strategies." Also, the Labor Relations Institute website offers a video preview of presentations by Smith, whom it calls a former labor organizer who "warns the average employee is very unlikely to learn the truth about unions until it is too late. She explains how the union works in real life." Miller said the union has heard reports that such consultants charge thousands of dollars a day to travel and make in-person appearances. So the union filed an open-records request seeking information from UTA about how much it was paying. The Salt Lake Tribune later filed its own request. Miller said the deadline for UTA to respond to the union&apos;s request was Thursday. Miller said on Friday that Teamsters had not received a response, and were waiting to see if something comes in the mail. He notes that the union lawyer says the law states that if no timely reply is given, it is considered a denial. "We&apos;re not surprised at the lack of response," Miller said, adding that UTA was also slow to provide other court-required information including email addresses of those eligible for the election, and said the union still has received no contact information for a few of them. Utah&apos;s open-records law urges a shorter response time for news media requests, within five business days instead of 10. The initial deadline to meet The Tribune&apos;s request was Sept. 2. But UTA said then that "due to extraordinary circumstances" it could not respond until after 10 business days  which was Friday. UTA said the delay came because it is "currently processing a large number of records requests," several of which "require extensive searching and reviewing." The Tribune had not received an official response by the end of business on Friday, nor did UTA answer several questions submitted by the newspaper about the consultants and their costs. Instead of answering those questions, UTA spokesman Remi Barron wrote in an email, "As I said before, your [open-records] request is being handled by our records officer." A subsequent phone call to that officer, Michelle Larsen, was not returned by the end of business on Friday. Barron added in a written statement, "UTA regrets that the Teamsters filed legal action against UTA. The judge ordered an election and we are cooperating fully. Our TRAX supervisors are an important part of our management team; we value them and the direct relationship we have with them. We are focused on maintaining this relationship, as their role and input is critical to UTA&apos;s success." Meanwhile, Miller also complains that UTA may be wasting money hiring a required third-party observer of the election. Miller said the union had worked with Salt Lake County government for it to provide such an observer at no cost. However, the union said UTA wanted instead to hire a professional observer. A judge approved that, but ordered UTA to cover the costs. Court records do not indicate the amount.